Panoramic Map of the Baltimore and Philadelphia (Ericsson Line) Steamboat Companys Route. This is a charming 1897 pictorial map of the Baltimore Philadelphia Steamship Company Route or the Ericsson Line by Avil Print and Co., Philadelphia. It covers the entire route from Baltimore through the Chesapeake Bay, the Chesapeake and Delaware Canal and the Delaware River to Philadelphia. Important steamboat ports, towns, bridges, railroads, and landmarks are noted throughout. 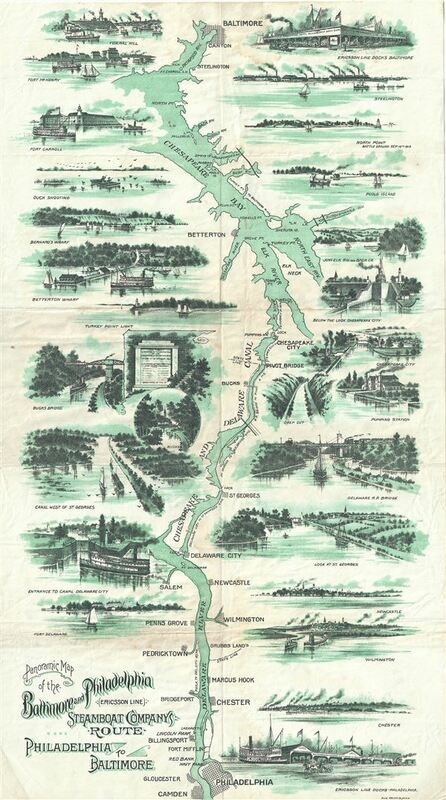 The left and right side of the map features beautiful views of Federal Hill, Fort McHenry, Fort Carroll, Duck Shootings, Bernard's Wharf, Betterton Wharf, Turkey Point Light, Bucks Bridge, Canal West of St. Georges, Entrance to Canal Delaware City, Fort Delaware, Ericsson Line Docks – Philadelphia, Chester, Wilmington, Newcastle, Look at St. Georges, Delaware Railroad bridge, Pumping Station, Chesapeake City, Below the Lock Chesapeake City, junction of Elk River and Back Creek, Pools Island, North Point Battle Ground Sept. 16th 1814, Steelington and Ericsson Line Docks Baltimore. The Baltimore and Philadelphia Steamboat Company started operating in 1844 and was named The Ericsson Line after its first ship, Ericsson. The Ericsson Line operated through the man-made Chesapeake and Delaware Canal and provided both passenger and freight service between Philadelphia and Baltimore. The map is accompanied by a pamphlet noting the schedule and fares of the steamship. This map was created in the first year of its operation by the Avil Print Co., Philadelphia. Very good. Minor wear and toning along original fold lines. Accompanied by original pamphlet.